healing every kind of disease and every kind of sickness among the people. 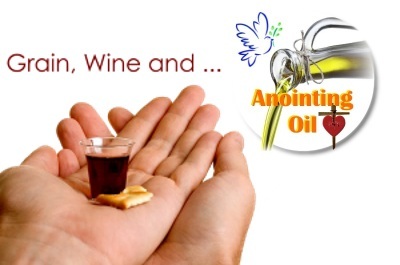 Jesus, the BREAD of life (grain), shed His blood (wine) - when we partake Holy Communion - we declare our body healed, restored! The law came by Moses (servant), Grace and Truth came by Jesus Christ (Son). Response from pastor Benny Ho of FCC below. Faith Commnity Church is probably one of the largest Singaporean/Malaysian church in Perth. The verdict for the case against the 6 key leaders of City Harvest Church including my personal friend, Pastor Kong Hee,is finally out. The law of the land has spoken and they have all been found guilty of all charges. Regardless of our personal opinion, we must respect and honour the decision that the judiciary has made. The outcome is something that we cannot control but our response is. How then should FCC respond to this heart-rending episode? I believe that Galatians 6: 1, 2 is a source of biblical guidance to us. Galatians 6: 1 - 2 - "Brothers, if someone is caught in a sin, you who are spiritual should restore him gently. But watch yourself or you also may be tempted. Carry each other's burden and in this way, you will fulfil the law of Christ." First of all, we must admit that there is a level of wrong-doing involved. I believe with all my heart that this whole episode started with the best of intention. Knowing Pastor Kong and Sun personally, I know that they had it on their heart to reach out to the younger generation through music that are culturally relevant. Unfortunately, what was started in the Spirit could have ended in the flesh. At the start of the Crossover Project, it was targeted at Asian youths in Singapore, Taiwan and Hong Kong; using wholesome music and lyrics to impart good values to the young but it ended in Hollywood. The climate in Asia and USA is completely different and to seek to navigate the complex music industry in the USA is extremely challenging. As the cost to penetrate the industry gets higher and higher, the leadership took greater liberty with their resources to meet the need. They allowed their purpose which is good to justify their approach which is deemed contentious in the eyes of the law of the land. They ended up paying a price for it. The end does not justify the means. Good purpose does not justify bad practice. So what can we learn from this? How should we respond to this? 1. Resolve to Act and Speak Kindly Towards the Leaders and Members of City Harvest Church Galatians 6: 1 - "Brothers, if someone is caught in a sin, you who are spiritual should restore him gently." This is not a time to judge and criticize but this is a time to grieve and identify. This is not a time for condemnation but a time for restoration. This is not a time to speak harshly but it is time to speak kindly and gently to a precious part of the Body of Christ that is hurting and in pain. The Apostle Paul reminded us in 1Corinthians 12: 26 - "If one part suffers, every part suffers with it..." It is disconcerting to see the response on social media especially from fellow Christians who are moralising, criticising and almost gloating over this situation. It is tantamount to kicking a wounded soldier who is on the ground. This is unkind and definitely not Christ-like. I would like to request for all members of FCC to refrain from this. A. We must recognise that all of us can start in the spirit and end in the flesh. No one is above temptation so stay humble and learn to listen more. B. We must remember that the end does not justify the means, good purpose does not justify bad practice. God's work must be done God's way. C. We must practice good governance because the Church is subjected to the law of the land. We must seek to be transparent, accountable and above reproach. The world is not interested in our purpose but they are scrutinizing our practice. D. We must surround ourselves with trusted leaders who will provide safety and counsel because we can all be wrong in our judgement and perspective. We must move from the "one big man" leadership style to "team ministry"
3. Resolve to Stand Together With Our Hurting Part of the Body Galatians 6: 2 - "Carry each other's burden and in this way, you will fulfil the law of Christ." This is the time for us to pray for Pastor Kong and CHC. This is the time for us to encourage them and let them know that we are hurting together with them. We share in their tragedy and we stand together with them in their pain. This is not a time to just reiterate all the wrong they have committed but also to remember all the good they have done, is doing and will continue to do as a church. In this way we fulfil the law of Christ which is the law of love.